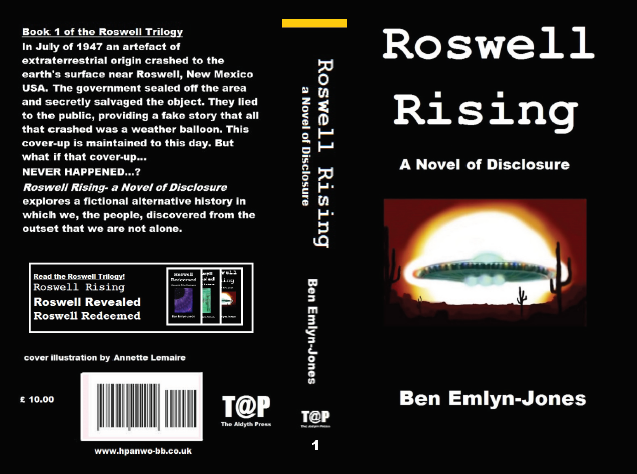 I have changed the covers of Roswell Rising and Roswell Revealed, see illustrations above. This is because there are now three books following the publication of Roswell Redeemed- Humanity After Disclosure, see: http://hpanwo-bb.blogspot.com/2018/12/roswell-redeemed-is-here.html. This means there is a trilogy so I've made the covers look like constituent thirds of a trilogy. They are still separate books so I have not altered the front covers at all. 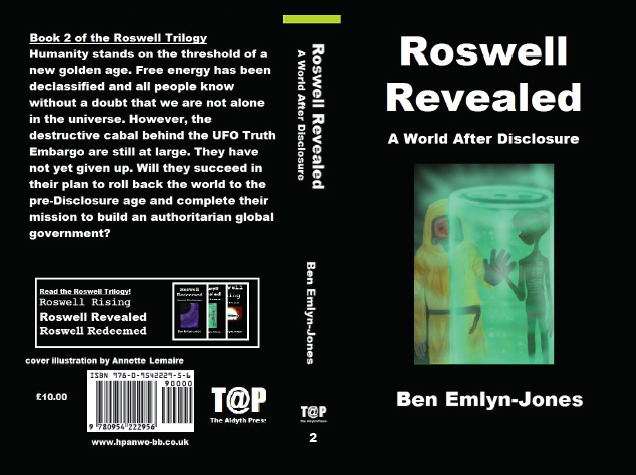 I have changed the back cover blurbs and added a segment advertising the whole Roswell trilogy. I have redesigned the spines so that they all look more similar and I've added the number 1 to Rising and 2 to Revealed to indicate their order in the trilogy. Redeemed already has the number 3 on it. All three spines also have a coloured strip that matches the colour scheme of the cover illustration. This makes the books easier to identify from the spine alone because I anticipate that readers might want to store them on a shelf together. My next step is to create box sets, see: http://hpanwo-bb.blogspot.com/2018/08/box-set-design.html. 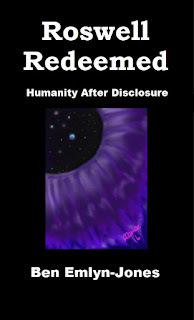 My new novel Roswell Redeemed- Humanity After Disclosure is now available on at least one retail platform, see: https://www.amazon.co.uk/Roswell-Redeemed-Humanity-After-Disclosure/dp/0954222997/. The novel is currently only issued as a paperback book. It will shortly be available from all other outlets. Sincere thanks to everybody who has inspired and supported me in this enterprise. See here for background. You can also read the first two chapters of the novel on this page as a free sample: http://hpanwo-bb.blogspot.com/2018/02/roswell-redeemed-sample-first-chapter.html. 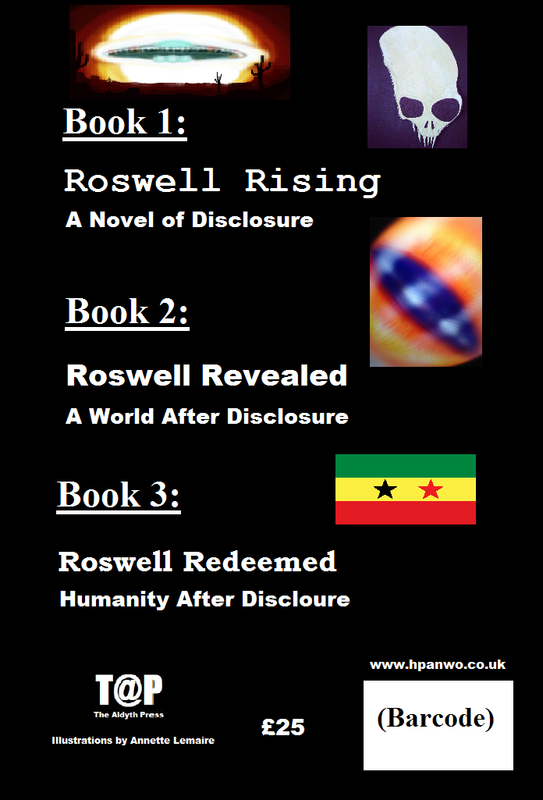 See here for the accompanying HPANWO TV video: https://hpanwo-tv.blogspot.com/2018/12/roswell-redeemed-humanity-after.html. I will be working on the box set, see: http://hpanwo-bb.blogspot.com/2018/08/box-set-design.html. The publication of Roswell Redeemed marks the end of the Roswell Trilogy. It is quite a sad feeling for me because it means I have to leave a parallel life that I have been living in for over three years. All fiction authors will know what I'm talking about. The main characters have become like real people, even though they are non-existent and just figments of my imagination. I have had to say goodbye to them. This does not mean I will never again write another story set in the Roswell universe; it is possible that I will. However, there is no doubt the Roswell story has finished for now; all the ends have been tied. 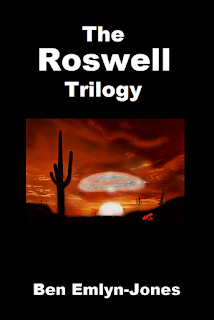 There will be no sequel or any other Roswell tale on that scale. I'd like to say thanks to everybody who has bought one or more of the Roswell novels; I really hope you enjoy them. And, of course, I have to say a big thank you to Stephen Bassett, the man who gave me the idea, way back in spring of 2015, see: https://hpanwo-bb.blogspot.com/2015/05/aurora-new-novel.html. As for what I will write next, I'm not sure and I have only vague ideas, but be sure that I will post any updates on Ben's Bookcase. 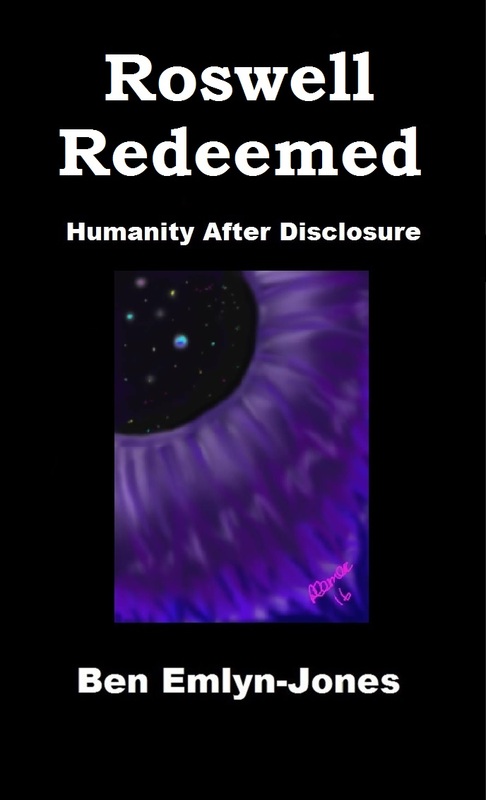 I have completed the final draft of my new novel Roswell Redeemed- Humanity After Disclosure. This of course does not mean that the book is now published. There is a lot of work to be done before it becomes available. I have to design the cover. That is something I'm going to enjoy because I can incorporate the superb artwork of Annette Lemaire; in the background link below you can see her image for the illustration. I will have to work on the general book design. I intend that Roswell Redeemed will end up the same trim-size as Roswell Rising and Roswell Revealed, but it will be somewhat thicker because it is slightly longer in extent than both of the others. I will also have to allocate an ISBN and plan the book with the originator and the printers. 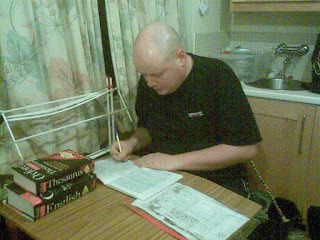 However, the biggest task of all will be, as always, revision. I'm very pleased with the draft I've written, but it inevitably will not be perfect. I will need to work through it again, correcting mistakes, adding new segments, taking out some segments etc. Even while writing this post I've thought of a major change I want to make to the ending. Based on feedback from Rising readers, I have employed a proof-reader again as I did with Revealed. Bear with me; I will post an immediate notice the moment the book is launched. In the meantime feel free to read the sample first chapter, see: http://hpanwo-bb.blogspot.com/2018/02/roswell-redeemed-sample-first-chapter.html. See here for essential background: https://hpanwo-bb.blogspot.com/2016/03/evans-land-for-sale.html. Sorry, but my personal stock of Evan's Land has exhausted. 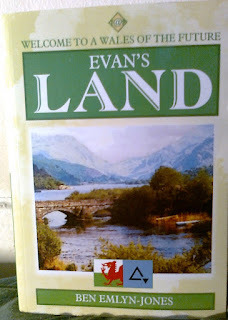 The large box of books that I thought were Evan's Land's are actually twenty copies of the Rockall paperback. I can't sell those because of the free second edition, see: http://hpanwo-bb.blogspot.com/2009/02/rockall-chapter-1.html. The original paperback is not as good anyway. So I'm going to give them away to charity shops. If you want to read Evan's Land it is now available at a reasonable price online, see: https://www.amazon.co.uk/Evans-Land-Ben-Emlyn-Jones/dp/0954222903. Or you could listen to the poor quality audio book I recorded myself, see: https://hpanwo-tv.blogspot.com/2010/11/evans-land-audio-book.html. 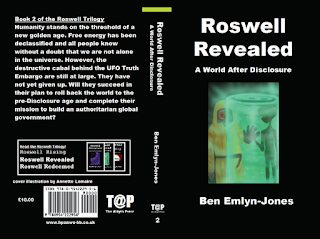 See here for essential background: http://hpanwo-bb.blogspot.com/2018/05/roswell-rising-ad-in-nexus.html. I have changed the design of the ad in Nexus magazine for Roswell Rising. 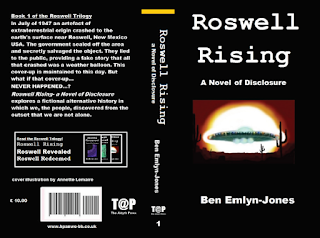 This is because of the five-star review given to it by Phenomena magazine, see: https://hpanwo-bb.blogspot.com/2016/10/roswell-rising-review-in-phenomena.html. It is an important marketing point and I should have included it at the start. This is the third issue I have run the ad and I will know by the end of this cycle whether or not it has worked because it is then that I get my quarterly statement from the POD company. 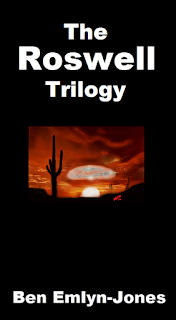 When the third book Roswell Redeemed is finished, see: http://hpanwo-bb.blogspot.com/2018/02/roswell-redeemed-sample-first-chapter.html, I will have written a trilogy. 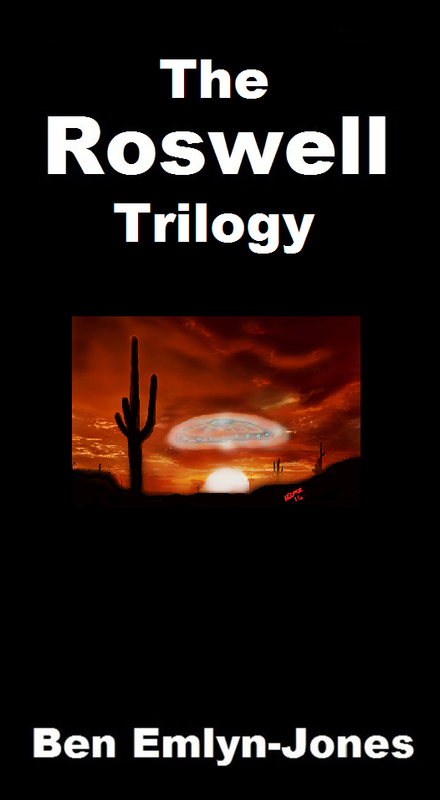 I have been thinking about this for some time and wondered for a while if it should be called "The Roswell Trilogy" or "The Disclosure Trilogy". I have decided on the former. A lot of book series are published in a box set and so I've designed one for The Roswell Trilogy and hope to bring it out. This is a basic and rough design because I don't know what the exact dimensions will be, and I won't until Redeemed is designed. I have also redesigned the spines of all the books so that they look better when placed in the box set. It also makes them identifiable from each other because the covers of all three books are so similar. The coloured bars are based on the colour scheme of the front cover illustrations. As you can see, I will be offering a discount for purchasing all three books at once. The illustrations are all by Annette Lemaire apart from the Volta Union flag on the back panel. Below are my drafts for the five panels and what I think the open side with the spine row will look like. Here is a design for the front cover of the upcoming novel Roswell Redeemed- Humanity After Disclosure. I've decided to adapt it from the same design as Rising and Revealed; partly because I like it and also because Redeemed is a direct sequel to the other two. The illustration is once again by Annette Lemaire. The book itself will be available later in the year. See here for the sample chapter: http://hpanwo-bb.blogspot.com/2018/02/roswell-redeemed-sample-first-chapter.html. "Just a Coincidence, nothing to worry about...!" What would happen if you gave a Hospital Portering Conspiracy Theorist, gave him a pen and some paper and told him to write a story? Carry on reading to find out! Ben's Bookcase is a blog where I will be posting some of my fictional writing, free for all HPANWO readers to enjoy. Here you will find short stories, novels, poetry, serials and other literature; all with an HPANWO-esque theme. 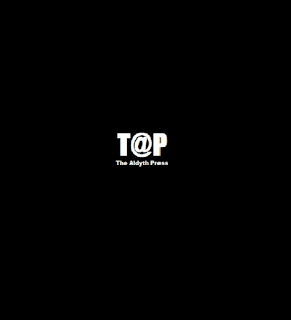 I also intend this blog to be an educational resource for all budding conspiracy and esoteric fiction authors. Happy reading!